After gardening in the heat and humidity of a Brisbane summer’s day, I find Turmeric Tea (Curcuma longa) most refreshing, especially if chilled and served with fresh, finely chopped mint leaves or lemongrass stems. An Indonesian friend, Hakim, introduced me to Turmeric Tea in 2010, saying “Drinking turmeric daily reduces body odour, helps keep you healthy and may prevent cancer”. Another favourite use for turmeric is making Sfouf, Turmeric Cake, a recipe from the Middle East. Turmeric Tea is a Javanese speciality, sometimes served hot, sometimes iced. 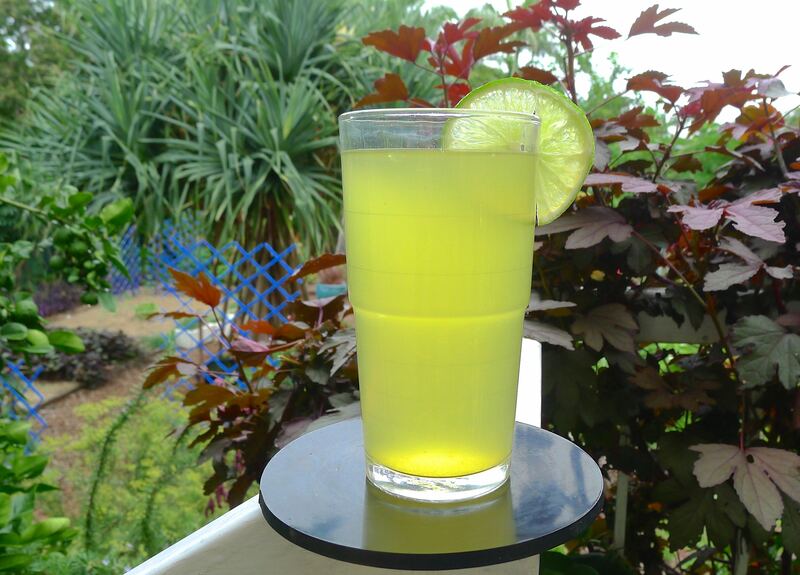 The Javanese believe Turmeric Tea to be a health tonic. Many, including Hakim, drink it daily. Recent research identifies curcumin, an active ingredient in turmeric, helps alleviate Post Traumatic Stress Disorder. Laboratory research indicates that regular consumption of turmeric alleviates inflammation in humans and it helps laboratory test animals to fight off certain cancers. Dr. Kevin Curran, a biology professor at the University of San Diego, teaches Cell Biology and Botany courses. Dr Curran discusses the science and history behind medicinal foods and maintains ethnoherbalist, a website promoting these topics. He asked me to link this website to his own webpage for turmeric (13.4.16). “Some proponents believe turmeric may prevent and slow the growth of a number of types of cancer, particularly tumours of the oesophagus, mouth, intestines, stomach, breast, and skin. I find one small, whole stem of a turmeric plant about 40-50cm high, including a rhizome, can be added to one litre of water and this makes enough tea to produce four mugs. Caution: Please consult your doctor before giving this drink to children, people with heart problems, high blood pressure. People who are taking medication for arthritis, rheumatism, high blood pressure, heart conditions and treatment for cancer should also consult their doctor before taking Turmeric Tea. Note: The cooking time can vary slightly, around 40 – 50 minutes. So after 40 minutes into the cooking time, I push a bread and butter knife into the centre of the cake. If it comes out clean, the cake has baked through. If not, give it another ten minutes. To enhance the flavour, I add one level teaspoonful of ground cardamom. This is a delicious traditional dish from Rajasthan, guaranteed to help you use up any surplus turmeric you grow! You can buy turmeric rhizomes ready for planting from fruit stores. Green Harvest sells a cultivar called ‘Madras’ growing in jumbo tubes. 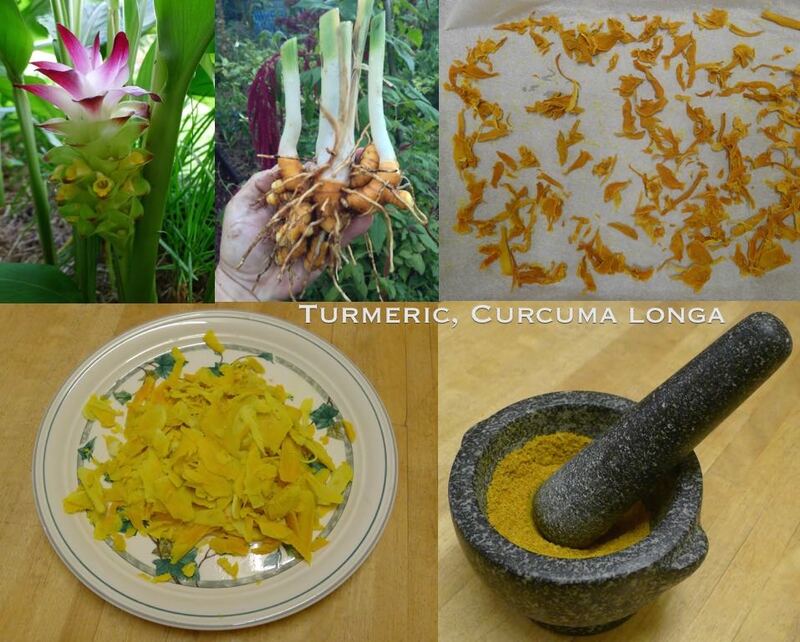 Turmeric is one of 100 species in the genus Curcuma, many of which are productive. Turmeric is a winter herbaceous perennial, and needs six hours of morning sunshine. Plants thrive in a compost rich, freely draining, well dug soil. Plants sprout as the summer wet season approaches, and for best results plants should be watered weekly in dry weather. The flower spikes look good in flower displays, and individual flowers are edible and may be picked out of the inedible flower spike and added to salads, stir fries and curries. The leaves may be thinly sliced and used in cookery, curries especially. Turmeric is winter herbaceous, so when plants die down to the ground in winter this is the gardener’s cue to harvest the rhizomes. Save some of the best rhizomes for replanting next year’s crop – plant them about 5cm deep, spacing them 30cm apart. Rhizomes for eating can be washed, thoroughly dried before storing in the crisper of a fridge. I store them in a paper bag because plastic may cause them to decay. This is a great way to warm the kitchen (and yourself) on a cold winters’ morning. Select firm, young rhizomes. Brush off soil, wash, remove any wispy roots that are attached. Put in a saucepan, cover with water, bring to the boil, then simmer for 40 – 45 minutes. Cool, then peel with a potato peeler. I peel turmeric under a dribbling tap, this rinses off any debris and prevents the turmeric from staining your hands. Slice thinly – I use a food processor (pictured below, bottom left). Place the peeled turmeric as a single layer on a baking tray lined with greaseproof paper (pictured, top right). Oven dry at 120C until turmeric is crisp and crunchy, which takes about an hour, depending on the thickness of your slices. Cool, then grind into powder using a mortar and pestle (pictured bottom, right). Store spice in an airtight jar away from sunlight (which can bleach the turmeric of colour). ← Why Does The Label Say My Ornamental Chilli Is Toxic? I am loving turmeric right now! For the tea you don’t use the orange part of the root but the stem instead? The only grocery store that sells turmeric around here only sells the root. Could I use the root as well? Just want to make sure I do it right. Great article ☺️Thanks! I keep the rhizomes in the freezer, and grate as needed. I will have to try this tea as turmeric is such a great spice to add to our diets.